Converging from across the country, Tannara are entangled in Scotland’s rich web of traditions. They play contemporary Scottish folk music: Considered, complex, arrangements that surround original tunes, modern tunes tunes and traditional ballads. Collective experience makes their musical approach unique. Despite their material’s modernity, it’s hardwired in spirit to the tradition of which their music is a continuation. At no point is the music pretty and delicate. 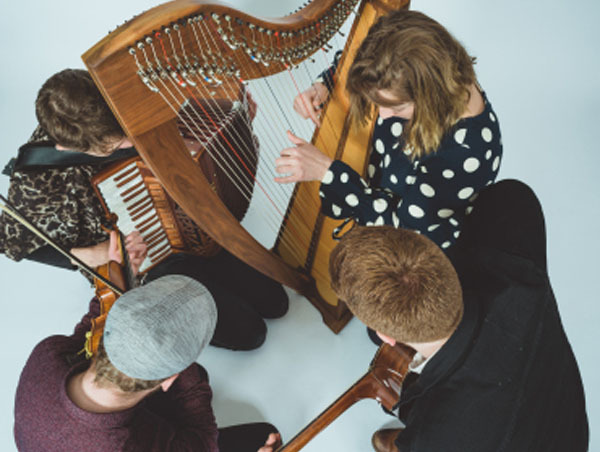 On fiddle, harp, guitar, accordion and vocals, Tannara play with a raw energy that brings booming sets of tunes and songs together with moments of knot-in-stomach beauty. It’s four big personalities bouncing off each other to create big sounds. The result is an electrifying live act. Stonehaven Folk Festival described them as: “One of Scotland’s Brightest Up and Coming Bands”. The Times: "Tannara blend fiddle, guitar, harp and accordion with sensitivity, dynamic variation and tonal awareness". Folkwords: “One of those rare debut albums that taxes belief.. I think it highly unlikely that one could listen to ‘Trig’ and remain unmoved, either by the vibrancy of the tunes or the pull of the ballads”. The Herald: “A quartet comprising fiddle, guitar, harp and accordion, they’ve developed their own group identity, playing smart, imaginative arrangements with verve”.